The first time I saw Hell Is Other Demons was through a lovely gameplay GIF circulating on Twitter. It looked squishy and lo-fi, oozing with thick colors. I hoped the rest of the game would live up to its bold aesthetic. Now Hell Is Other Demons is out, and I can’t stop playing it. Out on PC through Kongregate and Switch on April 18, the game has you play as a billowy white cat demon fighting through hordes of other demons to free the underworld from the autocratic forces currently controlling it. This starts with selecting levels from a grid structure and going into them to kill tons of demons, and then moving onto the next. 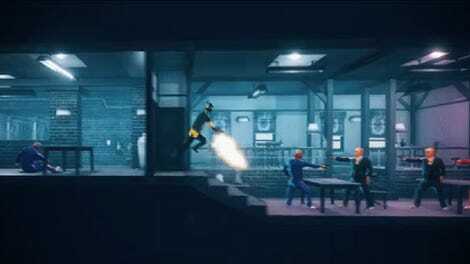 The game’s tight controls and splotchy, neon presentation already make it engrossing, but there are also a number of other clever wrinkles that further improve the entire endeavour. The overhead map is broken up into several small regions, each with a certain theme and color palette. The Boneyard is pink and full of spikes, while the Pusworks is green and full of toxic sludge. Each area has its own upgrade shop with unique stuff that gets more expensive as you progress. The cheaper unlocks can be just as effective, though, depending on the situation. I’ve been using a Twin Shooter I purchased from the first area for most of the game because it lets me shoot left and right at the same time. It’s still key to upgrade your health, jump height, and dash, so you still have to grind for gems from time to time, even if you aren’t upgrading your weapon. Each individual level is a 2D arena confined to a few vertical screens’ worth of space. Enemies attack in waves; as they rain down bullet hell, you can hop around on platforms to dodge their attacks and environmental hazards. The tactical focus revolves around on the floaty mobility afforded to you by your double-jump and sideways dash, and also, the plasma blasts emanating from your gun. You can kill most enemies by hopping on them, which also resets your jump count, meaning you can do another double jump. Dashing allows the cat to move through objects, including enemy fire. The game feels influenced by arcade classics like Mario Bros. and Pac-Man, but it dresses those inspirations up into something new and distinct. The moment-to-moment gameplay feels frenetic and resembles someone hurling glitter bombs into the middle of a light show. The game’s overall cycle is also deeper than it first appears. New levels require different strategies that derive from the slew of new abilities, weapons, and stat bonuses that can be purchased with the gems collected from fallen enemies. Levels in one area of the map might full of enemies with laser attacks, making it useful to unlock the ability to become immune them once enough damage has been taken. Other levels might be packed with demons that attack at close range, so there’s a helpful upgrade that automatically releases a counter volley of blasts any time damage is taken. Because the upgrades build out horizontally, rather than in a linear fashion of the strongest upgrades replacing weaker ones, collecting them all feels like exploring deeper into the game’s underlying machinery. One of the best things about Hell Is Other Demons is that the process doesn’t feel overly punishing. It might take several tries to beat a level, but the gems accumulated through each attempt carry over to your next attempts. There are also endless levels available in each area that keep spawning wave after wave of new enemies, making it easy to have fun trying out different builds while still efficiently building up your overall arsenal. Instead of being tedious, these parts of the game become fun, high-score chasing events in and of themselves. Each section of the game concludes with a boss fight. 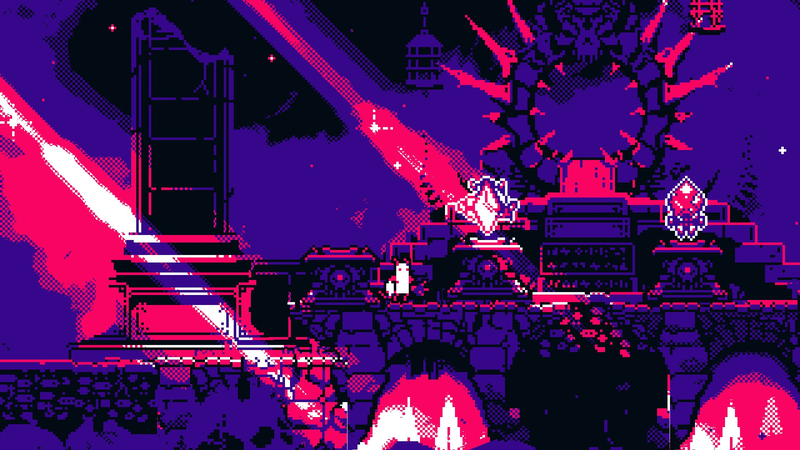 While these fights look more spectacular than the mobs of enemies on other levels, they will adhere to the same rules established by the enemies in a given area, making them feel like a final exam of sorts for the tricks and tactics you’ve been picking up along the way. The bosses could stand to be a little more difficult, but they are still one of the game’s visual and musical high points, embodying the way that twitchy platforming and bullet dodging merge together with the brooding electronic soundtrack to make Hell Is Other Demons feel like a unified, exhilarating whole. Correction: a previous version of this article incorrectly stated that Hell Is Other Demons had already been released. It does not come out until April 18.